Which web browsers should I support if I am using HTML semantic elements? As a web developer I am sure you have asked yourself many times how to decide which web browser your project should support when it is using new HTML5 semantic elements, well today I will try to summarize -with this short article- a list of resources and suggestions that could help you with this task. With this list of browsers we can support almost all new semantic elements HTML5. The next figure show a list of web browsers with full-support for HTML5 semantic elements (you can see the full list in: http://caniuse.com/#cats=HTML5). It is true that Internet Explorer 7 and 8 doesn’t support semantic elements but there is a list of “tricks” that we could use in order to create a good solution for that (Mondernizr and Polyfills). Figure 1. 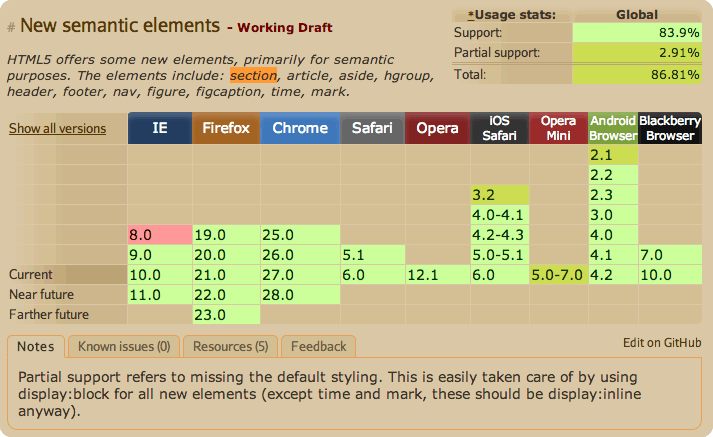 Semantic elements support in different web browsers. Below there is a list of websites where more information about this topic can be found. Details about HTML5 and CSS support in different web browsers(http://caniuse.com/).